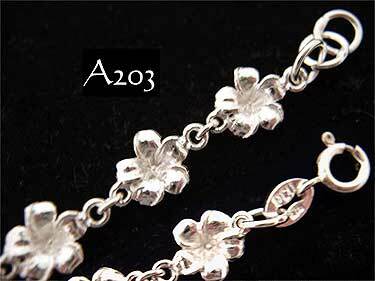 Sterling Silver Hawaiian Plumeria (frangipani) anklet featuring a highly polished leis of curled petal flowers each 8mm diameter. Secured with a strong bolt ring clasp. Measurements: 9.5 inches, 240mm long with links to downsize by 5mm.